Here are a few of the questions folks frequently ask us. We’ll do our best here to answer them, but if you have further questions please contact us by phone or just stop by the range. Can a non citizen/non permanent resident shoot at the range? Can I shoot just for the day? Can a felon shoot at the range? -Unfortunately the ATF will not permit us to allow any non citizen/non permanent residents to use the range, or even handle firearms in our facility. -Sadly this is not uncommon, but we have amazing instructors that can help you through it. Like a fear of dogs, chainsaws, or knives, brought on from television, movies, stories, or personal trauma, so too can a fear of firearms be established. Maybe someone let you shoot a gun that was way too big for you, or you or a friend personally experienced a gun-related trauma. Call us or come see us and tell us your story. We are happy to say that we have helped a good number people overcome this fear, and some of our favorite regulars are a result. can my Law Enforcement department use your range? -Certainly. Just have a decision maker from your agency contact us, and we’ll work out the details and schedule. Do you allow private bookings? -Sure! The cost is $30 a head, and that gets you. If you just need a 2-3 lanes we can do that Mon-Fri, but still require payment of 10 shooters to staff, and reserve the lanes. -Yes. In fact, the range is built to handle anything under 50BMG. -Yep, we allow those, too. 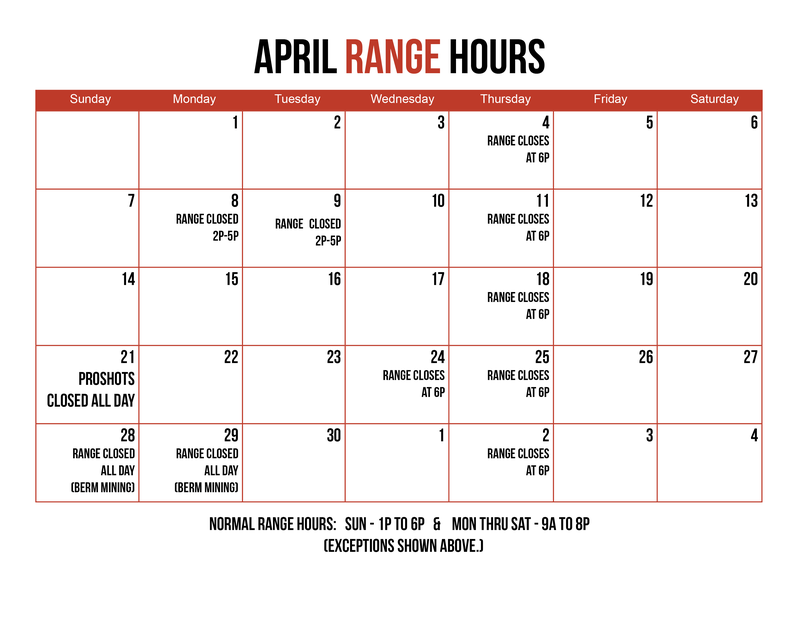 -Currently, Monday thru Saturday, 9am-8pm, but keep in mind the range closes at 6 on Wed-Thur to host our many classes and events. -Closer than you think. View our Location & Hours. -Any age is welcome provided they are with a responsible, supervising shooter 21 years of age or older. -Sure, as long as all safety rules are observed, and only one person shoots at a time. How much for a range pass? -A range pass is good for one day, and without time restriction unless we are at peak volume. If peak volume is met we will start an hour rotation and gettin pass varies in price. $10 any day of the week, for current or military or veterans. $5 any day of the week, for current or retired LE. $10 for kids 15 and under. -Yes, we already have and will continue to. Keep an eye on our calendar for dates and times. -Absolutely, and lots of it. –NO. It is unlawful for a felon to poses or operate a firearm without reinstatement of rights, or expungement of offence. To do so is highly illegal. -Anything can be dangerous if you aren’t careful, but if you follow protocol, you are more likely to be seriously injured driving to the range. Here are four things to always remember when around firearms. Always keep your finger off the trigger and trigger guard until your sights are on the target and you are ready to shoot. Be sure of your target and what is around and beyond it. At ProShots, we have many instructors who can teach you the proper way to handle a firearm. Just as you would not drive a car without proper training, you should not handle firearms without proper training.